Pujas are regularly held at Hayagriva Buddihst Centre. Please check the Calendar for times. A puja is a ceremony in which meditational prayers are offered to the Buddhas and holy beings to request their blessings or help. Traditionally in a monastery monks and nuns perform prayers for the long life, health and success of their teachers, friends, benefactors, all living beings, and for world peace. Pujas are performed to avert or clear three kinds of obstacles: worldly, inner and secret obstacles; conditions which prevent us from achieving our worldly and spiritual goals. Pujas are performed for general success in all activites, for the sick and dying, and for the deceased. Prayers and pujas are powerful methods to deal with difficulties in our lives, such as when facing sickness and death – our own and of those we love. The knowledge that there is indeed something we can do for those who are sick and dying can be especially comforting during a time when we may feel helpless. You are welcome to sponsor a puja at Hayagriva Buddhist centre. Please contact HBC for details. The word puja literally means "to please", thus Guru Puja means "to please the Gurus, or Spiritual Teachers". Why should we please them? Because they are fully dedicated to helping us develop our inner potential to be enlightened. In fact, we cannot become enlightened without their skilled guidance, and thus they are more important to us than anyone else. The idea of "pleasing" our Spiritual Teachers is for our own benefit, not for theirs. We need merit, or positive energy for our enlightened potential to grow and become perfect, and one of the best ways to do that is to make beautiful offerings and prayers to the Three Jewels and to our Spiritual Teachers. This is what happens in the Guru Puja.Students are encouraged to sponsor pujas and the greater abundance of offerings creates much good merit which is then dedicated for others. The puja begins with taking refuge and generating bodhicitta, the intention to become enlightened for the benefit of all beings. We then visualise the "field of Merit" which includes our present Spiritual Teachers and those of the past, as well as Buddhas, bodhisattvas, arhats, aryas and protectors of the teachings – in short, all the objects of refuge. Holding this visualization in front of us we offer an extensive version of the seven limb prayer: prostrations, offerings, confessing, rejoicing, requesting, beseeching and dedicating merits. Following that are prayers requesting inspiration for our Dharma practice, and then a special type of offering called "tsog" (a Tibetan word which means "collection" or "gathering"). Here we offer plates full of fruits and biscuits, which are distributed afterwards to the participants. The tsog can be eaten by oneself or shared with friends who have faith in the Three Jewels, but should not be given to animals or thrown in a dirty place. Then there are verses requesting inspiration to realize all the stages of the Lam Rim (Graduated Path to Enlightenment). The puja ends with the dedication of merits to the enlightenment of all beings. The seven Medicine Buddhas appeared to remove obstacles on the path to temporary happiness, liberation and the ultimate happiness of full enlightenment. They are specifically powerful in the healing of illnesses and the purification of negative karma. 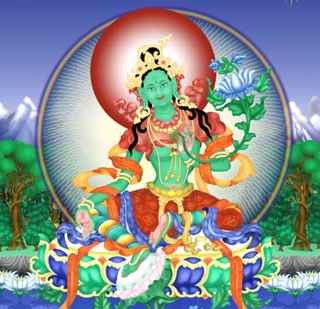 The practice of Medicine Buddha can also be done to help other people who are deceased, in order to liberate them from further suffering. You are welcome to sponsor a puja for ill loved ones and success in your activities. Please contact HBC for details. 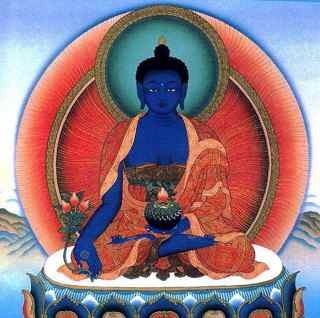 "Medicine Buddha practice is not only for healing. In addition, it is very powerful for success and for solving any problems. Medicine Buddha practice is good for someone who has died, for family problems, for someone who is sick, for receiving happiness and freedom from suffering, for finding a job, for success in business, etc." "…There are many benefits from reciting the Tara mantra or Praise to the Twenty-One Taras. Tara can solve many problems in your life: she can liberate you from untimely death; help you recover from disease; bring you success in business; help you find a job; and bring you wealth. When you have a really serious problem, such as a life-threatening disease, if you rely on Tara, commonly you will be freed from that problem, or you will recover from that disease… These are common experiences… Tara’s meditation practice is quick to grant success in obtaining the ultimate happiness of enlightenment. You receive much good merit, the cause of happiness. It prevents a suffering rebirth in your next life; you receive initiation from millions of Buddhas; and you achieve enlightenment. Remembering Tara, singing praises, and reciting mantras at any time of the day or night protects you from fear and dangers and fulfills all your wishes. Tara is particularly quick to grant help…"